This black pant set includes a traditional short sleeve dress shirt with a lay-down collar. This pageboy cap is crafted with a small piece of elastic in the back of the hat for easier fit. This outfit may contain small parts, and accordingly, it is not suitable for use by children unless under adult supervision. These outfits may also vary in dye lot from time to time. If you are ordering more than one for an event and need those to match in exact color pigment, please order at the same time. 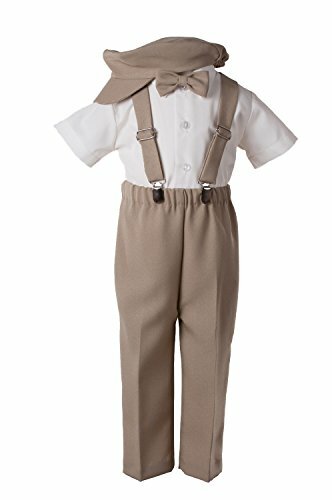 Outfit includes pant bottoms, matching newsboy cap, bow tie & suspenders white classic dress shirt. Available in Baby 6-12M, 12-18M, 18-24M, 2T, 3T, 4T and 5, 6, 7 Boys. Refer to Tuxgear's size chart in photo section. Slacks have an elastic waist band for easy comfort and fit. Suspenders are crafted of matching non-stretch linen, fully adjustable with nickel finger clips for easy comfort and fit.